Let’s start at the beginning: It’s all about intent. Today, while Google tries to discern your interest with all kinds of powerful and sneaky algorithms, Pinterest has a much more honest and transparent equation: You tell them. You’re planning a wedding. What better way to develop potential themes, design ideas, floral arrangements, etc., than to grab images and create a pinboard of visual styles? The result: a visual cornucopia of ideas. I’ve got Pinterest collections of robots, of mid-century modern furniture of clocks, and others. I enjoy creating them and using them as a roadmap of ideas. It’s a particular kind of organization, part hobby, and part visual to-do list. While other so-called platforms have pivoted and tried to be all things to all people, Ben Silbermann and his team have been building a solid, growing, user-centric business. So how did he get here, and what does the coming IPO mean for the future of the open web? First of all, a personal story. My longtime friend and New York leader in the angel investing community, Brian Cohen, called me in 2009. He wanted me to meet a sharp young man. Of course, since Brian was careful about whom he introduced, I said yes. Later that week, I was sitting across from Ben Silbermann. I remember the meeting well. The conversation was about an idea pulled from how creatives work, creating “scrap-boards” of ideas and images. Silbermann was passionate and warm, without the braggadocio of startup founders in a rush to be right. He seemed like the kind of patient, creative entrepreneur who would build, test, innovate, and evolve. Brian was right to send him to me. As a New York entrepreneur who’d gotten his first funding from New York angels, I felt some obligation to pay it forward. There was only one problem. My own startup was taking 18 hours a day, 7 days a week at that point. While Silbermann and I agreed on the central importance of curation of images, my video experience didn’t entirely align with his plan to build a photo-centric platform. In early-stage investing, offering cash is great, but ideally you want to be able to provide some value. So, after some consideration, I passed on the idea of working with Silberman. Brian Cohen said yes -- and that, as they say, is history. 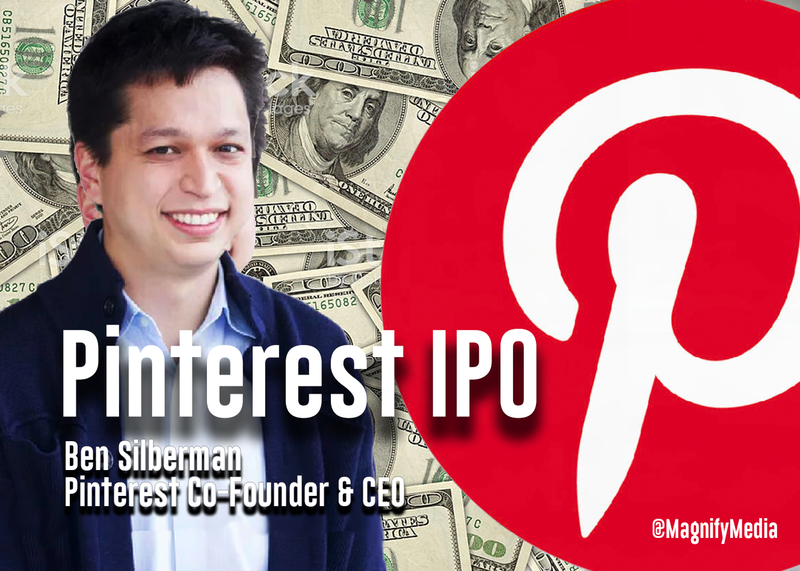 10 years later, Silbermann, at the ripe old age of 35, is preparing to go public with Pinterest, which currently has a $12.3 billion valuation. The San Francisco-based company will trade under the ticker “PINS,” and posted revenue of $755.9 million in 2018. It has almost doubled its MAUs (monthly active user) since 2016, hitting 265 million users last year. In 2016 Mary Meeker’s Internet Trends Report said 55% of Pinterest users were using the site to find and shop for products. This compared with just 12% for Facebook and an even smaller 9% for Twitter. So now Pinterest is poised to grow its intention-based advertising in a rapid and meaningful way. What’s next? Pinterest is still driven by images, and just launched its “max-width” videos on the platform last year. So, shoppers -- shop away.